Is Myanmar progress set to unravel? Editor’s note: Maha Hosain Aziz is a professor of politics (adjunct) at NYU's Graduate School of Arts and Sciences and a senior analyst at geopolitical consultancy Wikistrat. The views expressed are her own. She recently authored the Wikistrat-crowdsourced report on Myanmar’s political risk and futures. News earlier this month that the White House had decided to extend some economic sanctions against Myanmar may have taken some by surprise. After all, the country is broadly seen as having taken significant political and economic strides after being ruled for decades by a draconian military junta, not least in the freeing of hundreds of political prisoners. The reforms, which President Barack Obama suggested marked “a new direction” for the country, have prompted foreign investors to flock to the country, for everything from marine tourism, onshore reserves, offshore oil, mineral extraction to the fastest market for new and used cars. In addition, more than 5 million foreign tourists are expected in the country in 2015, and the country also received $4.1 billion foreign investment in the fiscal year 2013-14, up from $1.4 billion in 2012-13 (mostly from China, Thailand and Hong Kong). Meanwhile, the military’s historical control over the economy is also “significantly weakening” due to reforms, according to a recent report from the International Crisis Group. The report notes, for example, that the military’s holding company, Union of Myanmar Economic Holdings Limited, no longer receives tax free status and is being pushed out of key sectors it previously monopolized, such as edible oil imports. Yet while all this is commendable, there are significant hurdles for Myanmar to clear if it is to have any chance of meeting the lofty expectations its early reforms have created. For a start, corruption is still a significant problem, one that threatens to undermine faith and investment in investment in the country. Myanmar ranked 157 out of 177 countries in Transparency International’s Corruption Perceptions Index, while a U.N.-led survey this month noted that corruption is a “very severe obstacle” for local businesses. Another potential barrier to progress is a lack of education and skills in a country that one survey last year suggested had an unemployment rate of close to 40 percent. This has no doubt contributed to high levels of poverty – some 20 million people out of a population of 53 million are said to live in poverty. Such numbers are likely to fuel resentment among locals toward outside investors keen to develop land. In fact, activists and farmers have already engaged in protests over “land grabs” by investors. And while discontent is of general concern, there is particular risk of unrest among minority groups who may find it difficult to take advantage of growing opportunities from outside investors. The stateless Rohingya Muslim minority, which has already suffered discrimination at the hands of the government, seems particularly likely to face increased alienation from mainstream Burmese society. Other ethnic conflicts might also flare up again if local leaders’ demands that they have more autonomy over natural resources are not met. But it is the lack of political progress that might trump even bread and butter issues like recurring food and water shortages as barriers to continued progress. True, President Thein Sein has pledged the 2015 election will be “fair and transparent.” Yet already, restrictions have been announced. The head of the National Election Commission, for example, recently said that campaign methods such as large rallies, used to great effect by the main opposition party in the 2012 by-election, would not be permitted moving forward. In addition, election commission chief Tin Aye has reportedly told political parties that politicians will only be given permission to campaign in their own constituencies, a move that will hamper politicians with national appeal, such as democracy icon Aung San Suu Kyi and her party, the National League for Democracy. A greater barrier to Aung San’s influence, though, may be Article 59 of the constitution, which states that anyone whose spouse or children are citizens outside of Myanmar cannot become president or vice president. Aung San was married to a British scholar and her two sons are foreign citizens, effectively disqualifying her from any senior role in the next government. Meanwhile, as Aung San noted recently, the constitution guarantees 25 percent of seats go to the military in both houses of parliament. In addition, press freedom reforms seem to have been abandoned, as some journalists have been jailed. This has prompted some newspapers and journals to black out their front pages in protest. Constitutional amendments require the approval of more than 75 percent of lawmakers, followed by more than 50 percent approval in a nationwide referendum. And while the NLD and the 88 Generation Students Group have announced nationwide rallies and a petition drive in an effort to generate popular support, including from ethnic groups, for constitutional reform, the immediate prospects for change look dim. All this means that despite some encouraging progress over the past few years, ethnic unrest, widespread poverty and a failure to follow through on the spirit of promised political reform mean Myanmar is still a potential time bomb. And while investors might see an opportunity to make some money in a new Southeast Asian market, if disappointment with the pace of change sets in, a destabilized Myanmar might start to look like a much less exciting opportunity than it did just a year or two ago. Corruption and delibrate irresponsibility can bring down any nation at anypoint in time, as is the case with many african countries. Yes, and apparently in Asia, where Myanmar is located. Burma's independence hero Aung San was assassinated in 1947 and can not be active in political life in Myanmar today–despite this article. His daughter Aung San Su Kyi, the Nobel Peace Prize winner and member of parliament, hopes to run for President next year. Careful editing and editing remains important–even in internet journalism. Lmao @ banasy nicely played. The piece completely misses the biggest political development as well as the biggest political challenge in the country: the armed conflicts of the past 70 years and the peace process underway. Government has been battling over 20 different insurgencies with sway over large swathes of the country; the new government has signed 17 ceasefire agreements in 24 months; talks are underway on an historic National Ceasefire Agreement. The success or failure of that process over the coming months will determine more about the future of the country that anything else happening now. I'd hardly call what happened to the Rohingya Muslims "ethnic unrest". What really took place is a massacre and ethnic cleansing. More than 100,000 Rohingya people were displaced from their homes. 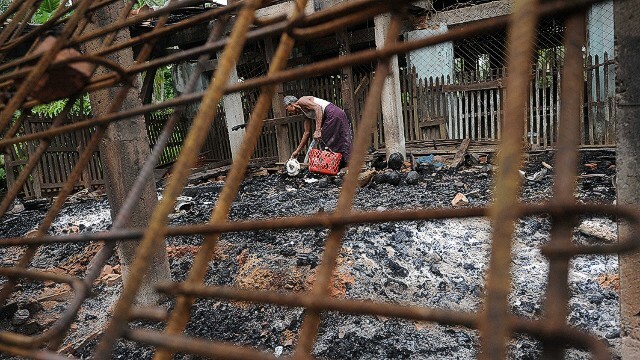 Their houses burned for what was really a community of peaceful people who were already being treated as outsiders and shunned upon by the Rakhine Buddhists. The Rohingya people are now scattered mostly living in appalling conditions inside Bangladesh without running water, electricity or a place to call home. The government didn't lift a finger to stop the violence. What the Burmese government needs to improve is the better treatment of their local minority. To compensate for the victims and treat them as equals. Only then will Myanmar have any progress. Aung San was Aung San Suu Kyi's father. It is not correct to refer to her by this name. I agree that Myanmar is at a difficult position right now. My take is the military wants to go very slow in giving up any more power. I think the only reason the military gave up any power was because it was so afraid of North Korea and China. The military may use the Muslim issue as the reason to stay in power. Remember, they need a threat and the Rohinga Muslims fit in their plans. will continue to be a major factor in Myanmar politics for a long time. As to new investments in Myanmar, stability is what they are looking for. Right now Myanmar is a stable country and investments are pouring in. Both the military and the reformers like Aung San have to walk a delicate balance. White House extension of some economic sanctions may have surprised some people involved with, or otherwise interested in, Myanmar. However, the US State Dept. – now with full diplomatic relations, including an Embassy in Rangoon, Burma – is careful to explain that this rapprochement is part of a "calibrated engagement strategy." This progress of Myanmar is way better than US-led liberalization in Middle east and else where. Why would you give a pass to Thailand which has same, if not more, kind of problems? Thailand has more military coups than Myanmar. Myanmar is located next to the three countries with billions of population and highest growth of population, ie India, China and Bangladesh. That is why you see problems of communal conflicts like you see in Northeast India (Assam) and Chittagong Hill Tract. You have so much misinformation via western media. Every thing happened in Burma in the past were all reactionary. It was not provocative. Unfortunate things happened spontaneously. The "democracy icon Aung San Suu Kyi" is a disappointment! She was much revered while she was under house arrest, as the icon for political ideals. Now she is a pragmatist, knowing realpolitik is her vehicle to power. She doesn't stand up for the ethnic minorities, because she needs the votes of the ethnic Burmese. I am not sure if this author knows much about Myanmar. The author cannot use Aung San to describe Aung San Suu Kyi, because Aung San is a National hero and the father of Aung San Suu Kyi. It is very serious incorrect representation. It feels like this author has done a lot of secondary research on Burma still doesn't have her facts straight. I wonder if she's actually ever set foot in the country. 53 million people – really? You might want to note that the number is closer to 60 million and the country just completed a fairly controversial census. Reforms have been going on for less than 3 years, and Burma is turning its ENTIRE country around. There has been progress, there have been setbacks – but be realistic please. How has our Congress performed in 3 years? What country has really done more in the past 3 years than Burma? Are our expectations for others so much higher than our expectations for ourselves? Unfortunately yes, they appear to be. And as Mr. Kerr notes in a previous comment – Burma is on the brink of signing a nationwide ceasefire agreement with its ethnic groups. The country has had the longest running civil war in the world. I don't think that political development is one that should be ignored but, obviously, that didn't pop up in the author's googling. Of course, author is a Muslim. There can be little progress in the face of Islam. Excellent analysis. I learned from this article, too, because southeast Asia is not one of my own áreas of specialty–mine are more the Middle East, Central Asia and North Africa, in addition to some European countries. Actually, as I was reading the first two or three parragraphs in Dr. Aziz's article, one question kept popping into my mind, which Dr. Aziz answers in the following parragraph without me having to ask it: the importance of the problema of corruption. Another concern I have is this: as foreign investors pour in and as Myanmar rapidly industrializes, how much of a probkem does Dr. Aziz think there will be with rising differences between clases/sociao-economic strata, and whether that will mean instability or even violence in Myanmar in the not-too-distant future? What can be done about it, if that is a problema at all? I am also thinking that investors, whether foreign or domestic, will take into account building their factories in places close to big cities with a lot of consumers to buy their products, or in places with easy access to sea ports or railways to get their products to export markets. Will this mean that the rest of Myanmar will fall well behind? And how big of a problem will this be? In China, there is a huge difference between eastern China, which has better access to sea ports and export markets, and which has become more industrialized and richer, and western China, which is more rural and poorer. In the case of China, I haven't heard of reports of violence due to rising class differences: the reports I hear are either from Tibet because of the conflict with the Dalai Lama, or from Xinjiang because of the activities of the Uyghur Muslim minority which wants more autonomy from the central government in Beijing. What does Dr. Aziz think will happen in Myanmar?